The rail operator 'Southeastern' has said that fifty stations in the south east will be shut tomorrow amid expectations of further snowfall. Revised service on Southeastern due to poor rail conditions. 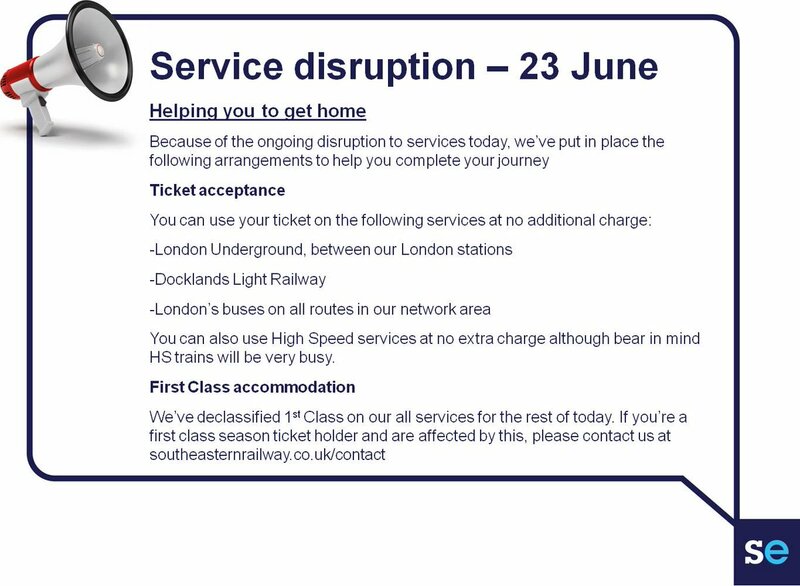 Advance Warning - revised service on Southeastern between Victoria and Dartford, between London Charing Cross and Sevenoaks and between Cannon Street and Hayes (Kent) due to poor rail conditions around the network. An amended timetable is in operation on some Metro routes on Monday 7 November, Tuesday 8 November, and Wednesday 9 November. Morning peak trains to London are unaffected by the amendments.. Some evening peak trains are expected to be revised from 7th to 9th November. There is a revised rail service on Southeastern between London Charing Cross and Dartford, between London Charing Cross and Gravesend and between London Charing Cross and Orpington due to flooding. All lines have now reopened following disruption caused by heavy rain and thunderstorms across the Southeastern network. Services are still subject to revisions, delays and cancellations. A new web app has been launched to reduce the number of people coming to harm on the railways in the South East. She's one of many Sussex commuters fed up with the standards of service of our trains but she has a bit more clout than the average commuter - and today she set about using it. Caroline Lucas, the Green Party MP for Brighton Pavilion, has launched a Parliamentary Bill proposing the renationalisation of the rail network. She says it would reduce fares, improve punctuality and save taxpayers a billion pounds a year. Andy Dickenson reports. The Department for Transport have now issued a statement for this report. They said: "We are determined to make journeys better and it is unacceptable that customers are not always receiving the service they deserve. "We believe that franchising provides the best way to improve services and closely monitor the performance of all train companies - and offer them incentives to meet targets." A replacement bus service is running on Southeastern trains between Hastings and Tunbridge Wells due to poor rail conditions.